If we would invest more time building our inner-man than the outer-man, what a wonderful world this would be. Listen, the gym is fine and a little makeup is fine too, but how much time do you invest in building your spirit-man and your character? Out of boredom, I took this test even though I know what will be the result of it. 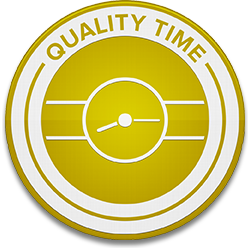 In Quality Time, nothing says “I love you” like full, undivided attention. Being there for this type of person is critical, but really being there—with the TV off, fork and knife down, and all chores and tasks on standby—makes you feel truly special and loved. Distractions, postponed activities, or the failure to listen can be especially hurtful. Whether itʼs spending uninterrupted time talking with someone else or doing activities together, you deepen your connection with others through sharing time. Can helping with homework really be an expression of love? Absolutely! 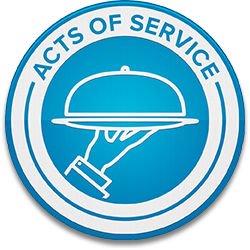 Anything you do to ease the burden of responsibilities weighing on an “Acts of Service” person will speak volumes. The words he or she most wants to hear: “Let me do that for you.” Laziness, broken commitments, and making more work for them tell speakers of this language their feelings don’t matter. When others serve you out of love (and not obligation), you feel truly valued and loved. 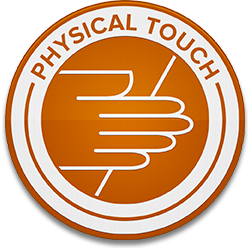 A person whose primary language is Physical Touch is, not surprisingly, very touchy. Hugs, pats on the back, and thoughtful touches on the arm—they can all be ways to show excitement, concern, care, and love. Physical presence and accessibility are crucial, while neglect or abuse can be unforgivable and destructive. Appropriate and timely touches communicate warmth, safety, and love to you. Actions don’t always speak louder than words. If this is your love language, unsolicited compliments mean the world to you. Hearing the words, “I love you,” are important— hearing the reasons behind that love sends your spirits skyward. Insults can leave you shattered and are not easily forgotten. You thrive on hearing kind and encouraging words that build you up. 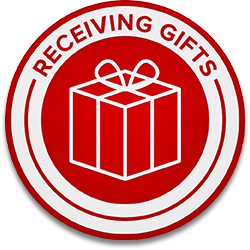 Don’t mistake this love language for materialism; the receiver of gifts thrives on the love, thoughtfulness, and effort behind the gift. 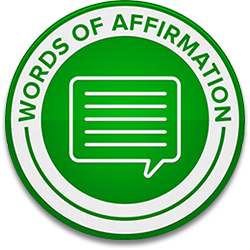 If you speak this language, the perfect gift or gesture shows that you are known, you are cared for, and you are prized above whatever was sacrificed to bring the gift to you. A missed birthday or a hasty, thoughtless gift would be disastrous—so would the absence of everyday gestures. Gifts are heartfelt symbols to you of someone else’s love and affection for you. College reunion, its been yearly. An event that everyone wanted to come but unfortunately this time most of them didn’t make it (we’re only 5 girls plus 1 boyfriend of my friend). But still, its worth it. At first, the time that was set for the meet up – most of them didn’t able to make it. I was irritated. Because I’m the type of the person who follow the time that was given if not exact time, usually I’m earlier than the given time. We had our lunch in a restaurant in which we are only the group of people who are eating there so meaning we can laugh, I mean LAUGH (loud and free, haha). We had our coffee and we walk a lot just to arrive to that place but its worth it because we got some place to occupied and seat. Another hour of chit chat about our lives in college, figuring out who’s barkada were from. Then the boyfriend of one of my friends was keep liking some of my post and then I said “you keep liking it, are you reading it first?” (haha, I know I’m so mean) my point was does he really have to let me see it that he’s doing it? (But I was thankful for time that they were there during the times I’m vent out those things) that’s why somehow I was calm by saying to him a while ago. Lastly, during our dinner which was down to four girls. We had our talks and in a middle of nowhere, I was shocked that the two girls talking about was true. Because she honestly admit it that she was single. After she said that, no question asked. And funny because on our way home which was down to three of us, they say that its enough already what the other girl said. Because if she really wanted to share it, it will come automatically from her. We don’t have to asked for details. Which is right? Same perspective of mine, be contented of what the other people what to share it with you. You can ask but just make sure you’re ready for their answers. That’s what you called Respect. Its the intangible gift we can share with the people we love – time and ourselves. Forgiveness is not pretending that everything is okay when it is not. When you forgive you are not denying or repressing your anger and pain. Genuine forgiveness is not plastering a smile on your faces and making nice. You either forgive or you don’t – there is no middle ground. If you struggle with forgiveness it is better to admit your inability to forgive and deal with it, than to pretend to forgive while you are burning inside of you. True forgiveness deals with your hurts in a way that doesn’t minimize the painful past, but rather minimizes the effects of that past on our present and our future. I choose to love you in silence, because in silence I find no rejection, and in silence no one owns you but me. Friends are the ones who say “I’m sorry” when you’re going through something difficult. Best friends are the ones who know how to fix it. Anger is inevitable. If you are human you will be angry someday. It’s what you do when angry that matters. When angry, take a deep breath, restrain your tongue, and walk away. Count the cost and swallow your pride. Every moment of delayed anger expression is a worthwhile investment in the bank of marital bliss. Speak when angry and your life will be filled with regrets. “Refrain from anger, and forsake wrath.” Psalm 37:8.